Music also seemed predestined. Tate actually attended the 1996 GRAMMY® Awards in the womb of her mother Dionne Farris. As a kid in Decatur, GA, she developed a passion for nineties R&B and hip-hop, citing Brandy, SWV, Missy Elliott and more as influences in addition to pop muse Gwen Stefani. 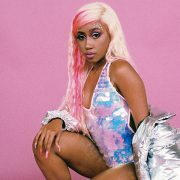 Sharpening a style of her own, the budding songstress made her introduction with 2015’s ROYGBIV and then the 2017 breakout single “Bob,” clocking nearly a half-million cumulative streams within six months. 2018 saw her drop the Cuddy Buddy EP, BOYS EP and Summer Lover EP as she prepped her next project GIRLS, writing and producing herself once more. In the end, this rainbow is about to shine brighter than ever in 2018 and beyond.